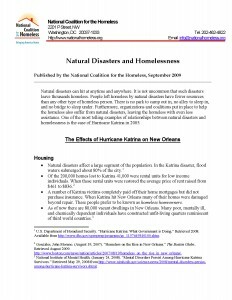 Extreme weather events are a very common cause of homelessness, especially when insurance and other rebuilding resources are limited. Many are still working to rebuild their lives from storms and other natural disasters that occurred years ago. But as an outreach worker in Houston says, “help for the homeless, often hard to come by under normal circumstances, likely will be even more challenging in the storm’s aftermath.” Moreover, people living on fixed incomes, working poor families, and those who are homeless often do not have the resources to evacuate or even collect needed supplies. The National Coalition for the Homeless urges all those suffering under extreme weather conditions, or sharing concern for those affected, to consider with assistance and compassion the position of families and individuals who are not able to get out of a storm’s path. “It’s just rain,” he said, echoing the words of others on the streets. The camp’s unofficial leader is Stanley Unc, 56…He says even if conditions were worse here, many wouldn’t have blinked — they are toughened by lives lived outside. He said others can’t grasp what their lives are like each day, much less on a day when a Category 4 hurricane hits. “They know what it took them through and we went right in the middle of it,” he said. “Broward County residents who do not have a permanent home or place of safety to reside are especially vulnerable during emergencies, such as a hurricane. When a Hurricane Warning is announced, the Homeless Helpline 954-563-HELP (4357), provides information and referral for homeless services in Broward County, including assistance in finding shelter, support services, or programs for individuals or families who are homeless or on the verge of being homeless. Additionally, when a hurricane warning is announced or a mandatory evacuation order is issued, Broward County Transit (BCT) buses will offer evacuation transportation from the assigned pick-up points to General Population shelters. Transportation will continue until sustained winds reach 39 miles per hour. What to Bring: Homeless persons are allowed one suitcase, duffel bag or plastic bag of belongings at the shelter. Additional belongings may be left at the nearest feeding program pick-up point until the evacuation order is lifted. The Monroe County Emergency Operations Center is now operational and the Emergency Information line is up and running for those who have questions about Hurricane Irma. The Emergency Information number is 1-800-955-5504. Key West Transit will begin hurricane evacuation service at noon Thursday. Buses will be clearly marked “hurricane evacuation” on the destination boards. They will circulate throughout the city, picking up riders at regular bus stops. Riders will be transferred at the Transit Center on Stock Island, and the buses will proceed to the hurricane shelter at Florida International University, picking up riders along US 1. Evacuees are asked to go to the nearest bus stop, or the Transit Center on College Road. Pickups will continue throughout the afternoon Thursday and resume at 6 a.m. on Friday. Weapons and alcohol are prohibited on the buses. Regular bus service – Citywide, the Duval Loop and the Lower Keys Shuttle – will end at midnight Wednesday, September 6th. New report once again misleads lawmakers and the public about the supposed ‘decline’ in numbers of people experiencing homelessness in the United States. As we rapidly approach the end of another year, cities around the country are preparing vigils recognizing those who have lived and died without adequate housing in 2016. November’s release of the Annual Homeless Assessment Report (AHAR) to Congress by the Department of Housing and Urban Development may give those attending some small cause for hope, describing a 3% decrease in the number of men, women, and children experiencing homelessness, counted on a single winter night, over last year’s number. Unfortunately the report leaves out some important information. For instance, the count in question tallies those staying in emergency and transitional shelters, as well as those who can be located outside. HUD’s recent decreases in funding for such shelters means fewer members of the homeless population are easily accounted for. 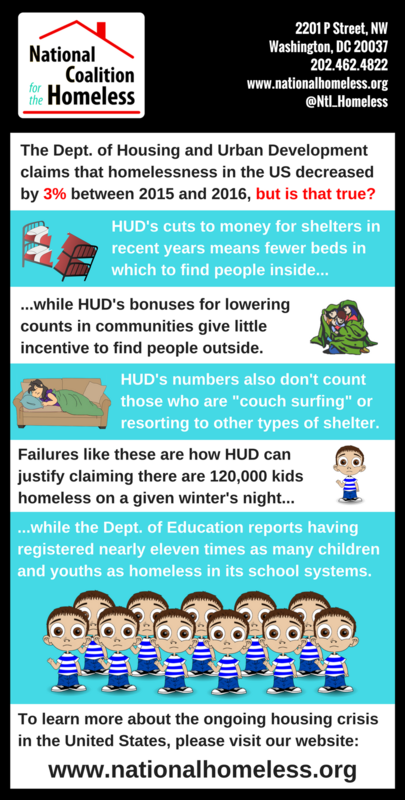 HUD provides bonuses to communities that decrease their count, creating a disincentive for those conducting counts to locate every unsheltered person in their neighborhoods. Furthermore, HUD only asks communities to report those who it considers “literally homeless.” This doesn’t include the large numbers of individuals and families who are doubled up or “couch surfing” with friends and relatives. This unrealistic definition of homelessness explains why HUD reported just over 120,000 children experiencing homelessness on a given night, while the Department of Education has reported well over ten times as many children youths registered as homeless in recent years, a number that has more than doubled over the last decade. The reports of HUD and other governmental and non-governmental organizations purporting to chart a decline in the numbers of those experiencing homelessness are doing a disservice to those men and women who we have lost this year without the basic dignities afforded by secure housing. While so many of those who are tasked with ending homelessness in America won’t admit to the actual scope of the problem, they cannot be relied upon to enact meaningful solutions to it. The National Coalition for the Homeless calls upon the Department of Housing and Urban Development to face up to the reality that homelessness is not diminishing in America. We call on HUD and its allies to work with us and other organizations to put into place housing policies and investments that will ensure an end to the memorial vigils that have become a disgraceful necessity every December 21st, the longest night of the year. “At what temperature are cooling centers required to be opened?” A homeless woman from the District asks one of my colleagues early Tuesday morning, with temperatures forecast to be near the century mark. A quick Google search and I was at the D.C. government’s website: It says in extreme heat, avoid encountering heat stroke, dehydration, and other medical problems associated with extreme temperatures. Cooling centers will be open at four government buildings… If temperatures hit or exceed 95F, cooling centers and select (8) homeless shelters will be available from noon until 6pm. Got it, easy enough! Question answered? Not in the District. The answer turns out to be more complicated. Let’s check the hotline listed on DC.gov “311 – The District’s Service Request Center”. It says, cooling centers aren’t open today. However, when I call the D.C. Emergency Management number, also provided on the DC.gov website, I’m told that cooling centers no longer exist, as of last month. Another colleague calls Tommy Wells’ office, at the D.C. City Council, to find out what’s what. No specific answer, but a commitment to contact the Committee on Human Services. They’re the ones who said that cooling centers do in fact exist, listing four government buildings as de facto centers. With too much conflicting information, I call back the D.C. Emergency Management number and speak to an assistant to the Director of Homeland Security and Emergency Management. He says cooling centers no longer exist, but that people can go into public buildings and use the water fountains. The director called a little later with a “clarifying” follow up call. She explained that the Office on Aging, D.C. public libraries, and the Department on Parks and Recreation have teamed up to provide relief from the heat. But unfortunately, cooling centers no longer exist and water stations, in public building marked as cooling centers, were closed. Too many government employees were taking all the bottled water. Seriously? Seriously! During the past few hours, The District removed incorrect information about the four government buildings that were not cooling centers – good start. But, the website still provides incorrect information: the description of heat relief services is wrong, select homeless shelters, listed as emergency centers, are closed or do not provide heat relief. This remains a totally unacceptable level of response. This summer has not even begun and we’re already facing dangerous heat conditions. Let’s not let the warning, provided by this recent experience, go unheeded and hope that this is not a sign of things to come. To see the D.C. Government page on extreme heat, visit www.dcema.dc.gov, and click on “Extreme Heat” on the left-hand sidebar.